Marsh, James H.. "Benedict Arnold". The Canadian Encyclopedia, 15 December 2015, Historica Canada. https://www.thecanadianencyclopedia.ca/en/article/benedict-arnold. Accessed 21 April 2019. As part of the campaign to invade Canada led by Richard Montgomery, Arnold led an expedition along the Kennebec, Dead and Chaudière rivers, arriving before Québec with only 700 of his original troop of 1100 men. 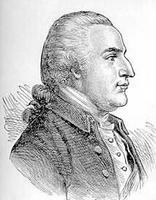 Benedict Arnold, soldier (b at Norwich, Conn 14 Jan 1741/42; d at London, Eng 14 Jun 1801). He apprenticed as an apothecary but ran away to join a New York company serving in the Seven Years' War. He later established a trading business in New Haven. Reacting to news of the Battle of Lexington at the onset of the American Revolution, he mustered the local militia and launched a successful attack on Ticonderoga, 10 May 1775. As part of the campaign to invade Canada led by Richard Montgomery, Arnold led an expedition along the Kennebec, Dead and Chaudière rivers, arriving before Québec with only 700 of his original troop of 1100 men. He assumed command when Montgomery was killed on the ill-fated attack on December 30-31 and remained camped before Québec until he was transferred to Montréal in April. He was in full retreat by June and saw further action on Lake Champlain and in the Saratoga campaign, each time distinguishing himself with conspicuous bravery. Though he pleaded that he was unsympathetic with the revolutionary cause, his treason was motivated by disappointment at being passed over for promotion, by a reprimand for using his office for personal gain, and by money. He defected in 1780 and was rewarded with £6315 and a generous pension. He moved to England in 1781 and to Saint John in 1786, departing in 1791 amid further controversy, resentment and legal entanglements. In 1798 he was awarded a large grant of land in Upper Canada but never took up residence there. He was an arrogant, ambitious man, whose military accomplishments have largely been obscured by his controversy, and his name remains synonymous in American lore with treason and infamy.